Even though the size of our TV’s are getting bigger and bigger each year, watching TV on your smartphone will never compares to sitting in your living room with your 50 inch TV, surround sound and The Lord of The Rings on Blu-Ray. But sometimes its just enough to satisfy your TV and movie needs, after all its portable, convenient and most people these days have their smartphone on them all the time. So with the right apps downloaded you’ll never have to miss your favorite shows again. Let’s start off with an app thats completely free, so if you don’t like the idea of having to pay a monthly subscription fee or you already have too many, then Crackle is the ideal app for you. The app, which is created by Sony Pictures Entertainment includes and ever changing selection of TV shows and movies including Seinfeld and Bewitched. The only thing required to watch any of these shows is a Crackle account, which is free of charge, this is a great app for people who are interested in on the go entertainment including some classic shows which you can tick of your list once you’ve watched it, because you never know when it will be available next. Crackle does have some exclusive shows you won’t find anywhere else, so it’s a good idea to download it to have along with all your other TV apps. Now’s the part where we start to move onto the apps where you will need a paid subscription to use their service. 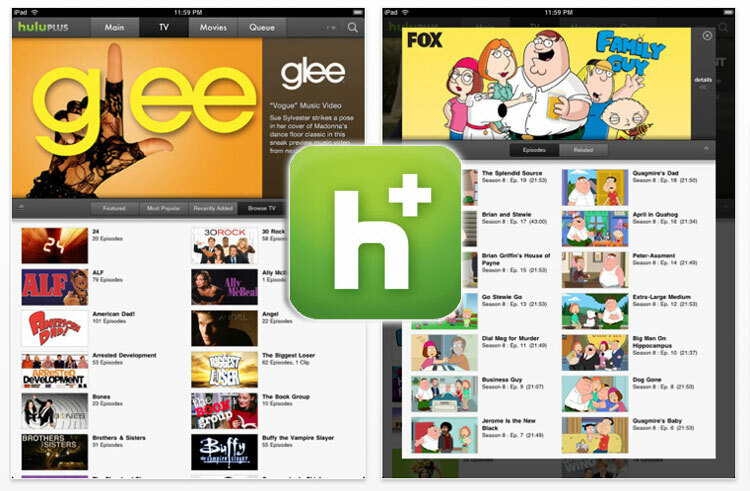 I tried to include more free apps but the ones that were free weren’t very good and didn’t hold up against other free apps such as Crackle, and certainly don’t hold up against our next app, Hulu+. It’s a great way to catch up on your favorite shows and watch entire seasons if you missed them the first time around as Hulu+ is usually very quick at getting the latest shows up. The tabs at the bottom of the screen allow you to search through the popular and trending videos, find a particular show or just jump straight into all the content Hulu+ has to offer. Because you can access Hulu on your PC as well, if you start to watch something online, you can immediately start watching it from where you left off if the shows in your queue. But to access all these useful features and diverse library of videos, you’ll need a subscription, which will cost you $7.99 a month. And finally, the service everyone was expecting to be on this list, and yes, it’s Netflix. 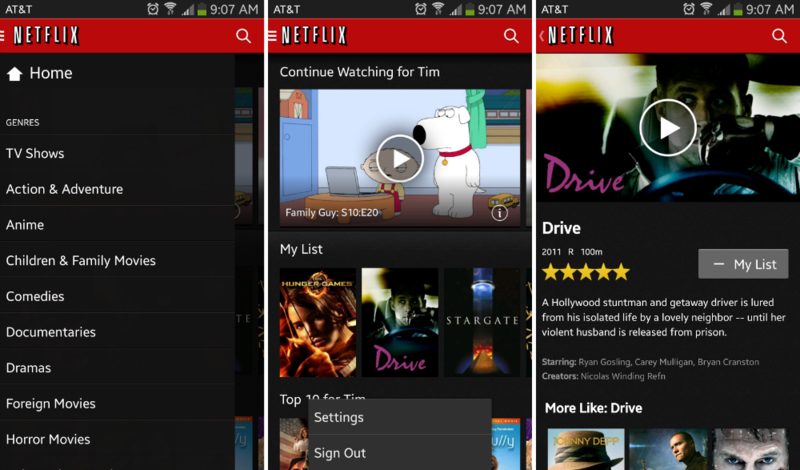 Out of every app I looked at, Netflix was the clear winner, both on the PC, smartphones, tablets. media streaming devices such as the Apple TV or Chromecast and even consoles. It has the biggest and most diverse library of videos which you’re most likely to watch, unlike all the free apps I check out. You can choose from House of Cards, Parks & Rec, The Office, Luther, Doctor Who, Scrubs, Orange is the New Black, Mad Men, Sherlock and finally Breaking Bad. See more: What is the Best ISP in the US or UK to watch Netflix with? With a library that’s filled with so many good shows, not to mention the vast amount of movies as well, it’s hard to choose any other app over Netflix, especially when you can access it on so many devices as well, it’s a sure fire win for all your TV and movie addictions. So for $7.99, you can access all those shows and movies which is more than any of the other app, you can now happily waste away the day sitting inside, binge watching all give seasons of Breaking Bad back to back.